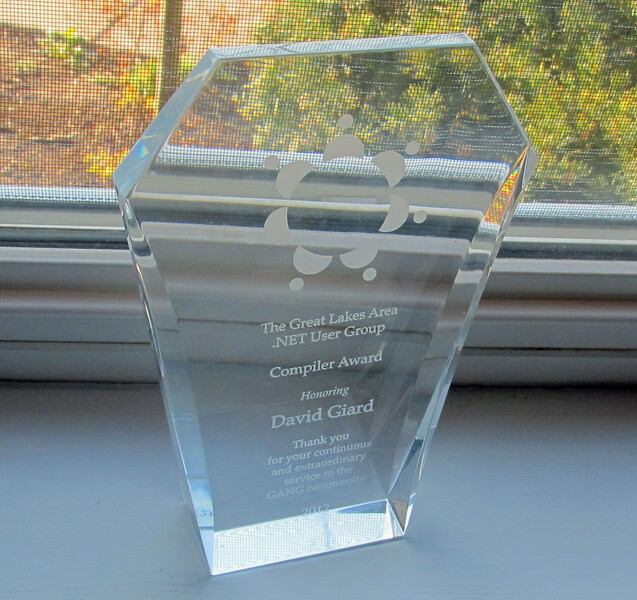 One of the most satisfying things I've done over the last few years has been my work with the Great Lakes Area .NET User Group (GANG). I've learned a great deal from the people in this group and my role on the leadership team has given me the opportunity to meet some of the smartest and nicest people in the industry. I love working with this user group because I love the people and it feels great when we put together an excellent meeting with a great speaker and an engaged crowd and tasty food. Thank you for your continuous and extraordinary service to the GANG community. GANG President Kent Fehribach said that this award will likely be given in the future, but he did not commit to any schedule. In any case, I am very proud to be the first recipient and grateful for those who thought of this. A few months ago, David McKinnon told me he planned to organize a conference at Cobo Hall. I was skeptical. At this larger venue, he could attract a much larger audience than to the previous 1DevDay, MobiDevDay, and CloudDevDay conferences he had organized, but the cost was higher. A lot higher. Still, Dave decided to take a chance and he signed a contract with Cobo. Months later, over 500 people showed up to see presentations on various software development technologies, platforms, and languages. The common theme was software development. On Saturday, November 17, the lines began to form at Cobo Hall. The registration line was so long that we had to delay Ted Neward's opening keynote presentation by 30 minutes. After that small glitch, the conference went very smoothly. Dozens of technical presentations were available to the attendees, open spaces, plus panel discussions, plus a gourmet lunch. The event finished with an excellent keynote by Chad Fowler and an after-party. I had the privilege of serving as Master of Ceremonies for this event and I could not have enjoyed this more. Throughout the day, people kept coming up to me and telling me how much they enjoyed the conference. After a few days rest, we may consider a 2013 1DevDayDetroit. Today is Thanksgiving and I am making pumpkin pies and preparing to call my mother and brother and go to my sister’s house and enjoy dinner and an evening with my siblings and their families. But I’m also remembering the good things in my life and thanking God for them. Today, I am thankful for my family - especially for my two sons who continue make me proud every day. I am thankful for my friends, especially those who supported me through the difficult times of my life. I am thankful for the occasional encounter with a kind stranger. These events renew my faith in the people of this world. I am thankful that I am stronger today than I was a decade ago. At that time, I had no idea how I would move forward. I am thankful for the success I've had in the community and for any respect that his been shown to me by my peers. I am thankful that I have not had to worry about feeding my family or putting a roof over my head. And finally, I am thankful that my faith in God has kept me focused on the future, despite my strong desire to dwell on the past. Many companies institute a formal review process each year. It is a lot of work, but it's an important part of developing employees. An Annual Review provides critical feedback to employees. In addition, it provides objective criteria on which to base raises and promotions. This week, I am responsible for completing an Annual Review for three Sogeti employees. At Sogeti, we call my role "Counselor" and these three employees are known as my "counselees". Of course, I also have a counselor, which makes me a counselee to him. My task this week is made more difficult by the fact that I don't work regularly with any of my counselees. But here is what I do to complete this process as fairly and effectively as I can. The annual review process starts at the beginning of the year. Push your counselee to articulate what their goals are for the year. Some of these goals will come from within themselves and some will be a result of feedback during the last annual review process. Goals can change and that’s okay, but it’s tough to achieve anything unless you have some objectives in mind. Talk to your counselees regularly throughout the year. I schedule a monthly conversation with each of my counselees. It’s on our calendars, so we won’t miss it. Usually, this is a phone call, but I try to meet them for lunch at least a couple times a year. Find out how their project is going. What challenges are they having? What are they doing well? Is there anything they need from you or elsewhere in the company? Have their goals changed since the beginning of the year? If they received a flattering e-mail, ask them to forward it to you. Give them direct feedback during these meetings. If you cannot answer a question, follow up later with someone who knows the answer. Take notes during these meetings. OneNote is a great tool for this. Often, I end up copying text directly from these notes and pasting it into the Annual Review form at the end of the year. If you are meeting regularly and having open conversations, there should be no surprises at Review time. Encourage your counselees to keep a record of their accomplishments throughout the year, so that they can more easily articulate them at the end of the year. I always tell my counselees not to rely on me to remember anything they did during the year. There is a good chance I will forget something and there is a non-zero chance that I might not be with the company at the end of the year. At one of my former company's we had a slogan: "You own your career". Employees should understand this and it’s a counselors job to make sure they do. If your company publishes guidelines for the annual review, read them thoroughly and base your review on these guidelines. The less subjective your review, the easier it will be and the more fair to all involved. Include specific examples in your evaluation. "Bob did a great job at customer XYZ" is far less meaningful than "Bob rewrote the Shipping screen, so that it now runs 70% faster, saving the customer 2-4 hours per week." On the flip side "Joe needs to improve his communication skills" is less effective than "The customer expressed frustration because he did not know that Joe's project was behind schedule until he failed to meet his deadline. Joe should have communicated the schedule slippage weeks earlier when he became aware of the roadblock." Be honest. Often, you will find yourself evaluating a friend and it's tempting to let personal feelings sway your evaluation. Friendship should only affect an evaluation if there is a criterion for getting along with others. In all other areas, stay objective. Otherwise, you are not being fair to the other employees. Honest feedback is how an employee improves. Give an annual review process the time and attention it deserves. Employees deserve this. While traveling recently, I lost my wallet. It happened in the airport - somewhere between the Detroit security checkpoint and the Baltimore luggage claim. After checking with the airport and the airline and retracing my steps, I was convinced it was lost forever and I began to replace the cards inside. Weeks later, I received a message on Facebook from a stranger. A woman found my wallet in the airport. Reading my name on my driver's license, she searched for me online and found me on Facebook and sent me a message, so that I could confirm my identity and my address. Shortly after our Facebook exchange, the wallet arrived in the mail, along with a money order for all the cash that was in it - over $200. I was struck by this incredible act of kindness and honesty by a complete stranger. She could easily have kept the wallet or kept the cash and no one would have known or thought poorly of her. But she went out of her way to find me and return everything she found. I am unlikely to meet this woman personally, but that does not mean I cannot repay the kindness. My plan is to pay it forward - to pass kindness on to strangers who cross my path. The likelihood these strangers will repay me in kind is low and I accept that. With any luck, they will be inspired to help others and the kindness will work its way back to the original stranger who helped me and the universe will be remain in balance. And a better place. You are swamped. Four weeks to finish this project will barely be enough time. You're working late every night and still don't seem to be making headway. The boss comes over and asks if you have time to do this simple task. What is your response? There are only two possible responses, right? Yes or No. Either you tell the boss 'No', you cannot accommodate his request because of the amount of work you have; or you tell him 'Yes' and commit to not seeing your family until after the holidays. But are those the only two responses? Consider telling him "Yes, but". "I'm happy to do this boss, but it will cause the schedule to slip on the other tasks I've been assigned. Is that OK? Can you help me to prioritize so I know which tasks to drop or defer?" Often the boss had no idea his "small" request would have such an effect. If someone other than the boss comes by, a similar response works. "I'm happy to do this, but it will impact the delivery schedule of the other items I'm working on. Let me verify that the boss is ok with letting the schedule slip." In both these cases, the response is close to saying “no”, but the delivery puts the decision back into the hands of the one making the request. It also politely calls attention to the fact that your time is not unlimited – a fact that is easy for others to forget. There is no guarantee this will be effective (tyrannical bosses do exist), but generally people are reasonable and, if they make unreasonable requests, they don’t realize they are doing it. Sometimes, it’s up to us to provide that perspective. You can maintain a positive attitude without killing yourself by being honest with those around you. So last night I go to the bar to get all liquored up and I says to the bartender: “Gimme my favourite getting-liquored-up drink – a dirty vodka martini with extra olives and Grey Goose vodka. And we go out back where my private jet is parked and we fly down to Tampa where he meets my parents and they tell him how I was born during the Kennedy administration and they explain how I was such a rotten kid that my dad went to the War in Vietnam just to get a break from me. Then we get back in my private jet and we fly to Jacksonville, NC to the hospital where I was born and they show us my birth certificate and the bartender asks me “Can you prove that you are the David Giard listed on this birth certificate?” and I proceed to provide him with blood samples and fingerprints and utility bills and all sorts of evidence that I am in fact the David Giard listed on the Birth Certificate. So we fly back to the bar and the bartender says “OK, you’ve convinced me that you are David Giard and that you were born more than 21 years ago” and he mixes up my favourite getting-liquored-up drink and I drink it like the grown man that I am. …Some of the above story is untrue. First, I don’t drink Grey Goose. I’m a Ketel One man. Second, I don’t own a private jet. And finally, the bartender does not have time to personally verify the identity and age of every young whippersnapper who orders a drink. If he did so, he wouldn’t have time to serve other whippersnappers and they would go away thirsty and cranky and he wouldn’t make enough money to keep the bar open. Instead, the bartender has to trust someone else. But who can he trust? Probably not me. As we’ve already seen, I am capable of telling a convincing story that is not 100% true. In my case, he will trust the state government because months ago, I went to an office run by the state of Michigan and I proved to them (by supplying a birth certificate, a photo ID, a utility bill, and other documents) that I am David Giard and on what date I was born. It turns out that the state government has been verifying such information for a long time, so they are pretty good at it. When I had satisfied the government office, they issued me a “token” verifying my identity and certain claims about me, such as my date of birth. This token took the form of a Driver’s License. This Driver’s License claims that my name is David Giard and that I was born on a specific date and that I look like the photo in the corner of the license and that I reside at a specific address. Claims-based authentication works exactly like this. In claims-based authentication, an application does not authenticate a user directly. Instead, the application directs the user to a trusted authority (known as a “Secure Token Service” or “STS”) and asks the STS to authenticate the user. In some cases, this STS may even decide to ask some other STS that it trusts to authenticate the user. When the user has been authenticated, the STS will create a token to return to the application. This token contains proof of authentication, but it may also contain a number of “Claims”. Claims are attributes about the user that are asserted by the STS. Because the application trusts the STS, it will believe these claims about the user. Much like the bartender believes the birth date on a valid driver’s license, the application believes the claims contained in the token. And just like the bartender applies his own rules based on the driver’s license claims (you must be 21 or over to drink), the application can apply whatever rules it sees fit to authorize the user based on claims contained in the token provided by the STS. For example, the application may decide that only users in a given role may view certain pages in an application. Or that certain links are disabled, unless a user has been with the company a certain length of time. Thus, the authentication (who is this user?) is outsourced to another application, but the authentication (what can this user do?) is not. I, Steve sounds like an autobiography written by the late Apple founder Steve Jobs. The title is eerily similar to the the autobiography title of Steve's former partner, Steve Wozniak. In fact, I, Steve is a collection of quotes by the tech visionary. gathered together into a slim paperback and organized by category. It was obviously thrown together quickly after the death of Mr. Jobs, and probably compiled almost entirely from online searching. Still, there is a lot of wisdom in this collection. Jobs was a visionary and his company changed both the computer market and the electronic devices market. So, it's not surprising that he revealed this vision in interviews, speeches, and conversation. The following quote from a 1999 Time magazine interview could serve as well as any mission statement. "The roots of Apple were to build computers for people, not for corporations. The world doesn't need another Dell or Compaq." Jobs's famous quote "Real artists ship" appears several times in the book - In part because he was fond of repeating it and in part because it is appropriate to multiple categories. Although you'll find some inspiration among Jobs's words of wisdom, the lack of context make this book little more than a trivia book. Still, Jobs's words were entertaining and inspiring and you could do worse for bathroom reading. I'd like your feedback on a conference I am considering helping to organize. This idea was originally suggested by Matt Ruma, but I like it and I would like to help him execute it. The conference would feature speakers delivering 10-15 minute "Lightning Talks" on a technical topic. Following each talk, a designated panel of experienced speakers would provide 5 minutes of feedback to the speaker about his presentation. The feedback would cover the topic, the demos, the speaking style, the slides, anything that contributed to the quality of the presentation. After 2 speakers, we would all take a short break to stretch. Using this format, we could have 12-15 Lightning Talks in a single-track, all-day conference. There are two primary goals of this conference. Audience members could learn from hearing a series of Lightning Talks, possibly getting a brief exposure to some new technologies. Speakers (particularly inexperienced speakers) would receive valuable experience speaking in front of an audience and valuable feedback on their presentation. One advantage of this format is that delivering a 15-minute presentation is far less intimidating than delivering a 60- or 75-minute presentation. Part of the inspiration for this conference comes from the excellent Kalamazoo X conference, organized each year by Michael Eaton. However, the speaker feedback and the emphasis on technology rather than soft skills would distinguish this conference from Kalamazoo X.
I'd like to hear your opinions on this. Is it something you would be likely to attend? What ideas could make the conference more successful? Please add your comments below or post them on Twitter with the hashtag #SpeakerConf. You can find me there at @DavidGiard. If you are running a user group or organizing a technical conference, one challenge you will face is finding good speakers. The problem is compounded by the fact that most such organizations run on a limited budget. Many speakers are willing to freely donate their time because they enjoy presenting, they want to help out, and it increases their reputation. However, it’s not reasonable to assume these speakers will also be able to donate their own money to travel to your group. Some areas don’t have a large pool of good speakers on which to draw. Even if you are fortunate enough to live in such an area, I still think it enhances local events to bring in some speakers from other areas. Bringing in a speaker from another area costs money. Someone has to pay for transportation and lodging. Either the speaker will decide to donate his money as well as his time or your group will find the funding to make this travel possible. Fortunately, you have a few options. INETA: For years, INETA has helped bring speakers to other parts of the country. Recently INETA changed their speaker programming, focusing more on helping speakers who travel within their own region. Currently, there are hundreds of speakers registered with INETA. This expanded the number of speakers, but decreased the maximum amount paid to each speaker. You can request an INETA speaker at http://ineta.org/Speakers/SearchCommunitySpeakers.aspx. I am a registered as a speaker with this program and I know many others also registered and I can tell that it does help to offset at least some travel costs. Local Sponsors: Because user group audiences are a great target market for recruiters and hiring managers, you can often find companies willing to pay a speaker’s travel expenses in exchange for some free publicity and a few minutes in front of your group. Find out what companies are hiring or recruiting and make a few phone calls. Evangelists: The job title “Evangelist” is a relative new one in the software world. However, many companies employ individuals as full-time Evangelists. Their job is to spread the word about the company and its technology – often by delivering technical presentations at user groups and conferences. Part of their performance review includes something called “reach”, meaning the number of people who read, see or hear their message. By inviting them to your group, you are increasing their reach. If your audience is in their target market, it probably won’t cost you anything. My experience is that most Evangelists are not focused on delivering a sales presentation; however, it’s worthwhile to verify the topic with the speaker ahead of time. Speaker Programs: Many companies sponsor a select group of speakers who travel to user groups and conferences. While these speakers are not employees of the company, they do get some of their travel costs offset by the company in exchange for some publicity during the talk. This allows the company to reach a larger audience than they could using only their Evangelists. It also allows many speakers to travel to more events than they could afford on their own. 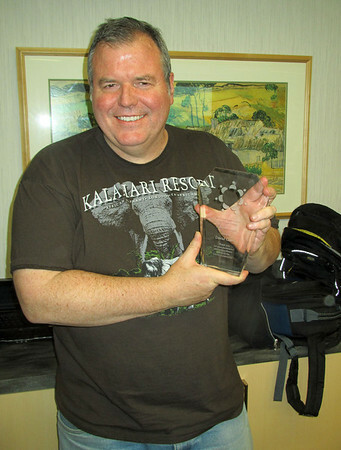 I am a member of such a program - the Telerik Insiders - and it has been very beneficial to me and to Telerik. You can see a list of all Telerik Insiders at http://www.telerik.com/community/insiders.aspx. Several other vendors have similar programs. These are some resources to find speakers and some ideas for finding funding for speaker travel costs. Don’t let geographic barriers prevent you from bringing the best speakers to your next event. I recommend starting by looking in your own area for good speakers. My geographic area (southeast Michigan and environs) is blessed with many good speakers and we often exploit this at local user groups and conferences. Get out and find these speakers. Learn who is speaking at user groups and conferences in your area and contact those people. Better yet, attend those events so you can hear and meet these presenters. Establish a personal relationship with them, so they will be more likely to donate their time to your event. You can also use your event to help cultivate inexperienced speakers. Multi-track conferences and short Lightning Talks at a user group are great ways for new speakers to gain experience in front of a live audience. At the Great Lakes Area .NET User Group, we host up to two Lightning Talks per monthly meeting. A Lightning Talk is a 10-minute presentation on any topic and is a great way to practice one’s presentation skills in a low-risk environment. Often a member will start by giving a Lightning Talk and will go on to speak at local and regional conferences. It’s tempting to bring in big-name speakers from other parts of the country, but don’t ignore your backyard. You are likely to find some excellent speakers in a convenient location. This screencast demonstrates how to change a Visual Studio 2012 Coded UI Test after you have recorded it.